Crow Close, a field at the eastern end of Bingham, was the first site in England to be described as a deserted medieval village, having been identified as such in 1907 (Allcroft, 1907). It is now a scheduled monument, number 29905, and was first listed in the schedule on 3rd March 1956. No archaeological investigations have been carried out on this site since the original survey in 1907. Although it is assumed that it is a deserted medieval village, it has not been dated and the reasons for its desertion have not been explored. Despite this, its existence has played a prominent part in thinking about the origin of Bingham. Various models have been postulated including Crow Close and Bingham as twin, medieval villages or that Crow Close was the original site for Bingham before the market town was developed at its present site. 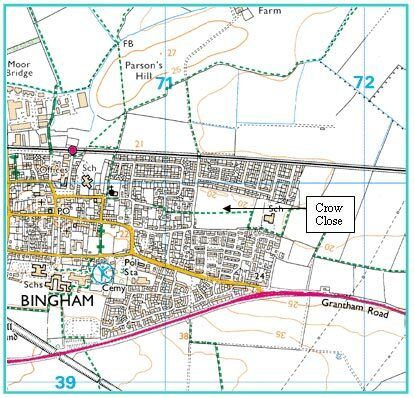 It is important, therefore, to the understanding of the history of and the pattern of settlement in Bingham that Crow Close should be investigated. Thus, the main purpose of this project was to carry out a detailed topographical survey of the field, followed by a geophysical survey of parts of it so as to help interpret the earthworks that are clearly visible in the field to confirm that they are, indeed, part of a deserted medieval village and to lay the foundations for a later, more detailed enquiry, should it be considered necessary. The location is about 800 metres east of the Market Place and 550 metres from the parish church. It is surrounded on three sides by housing. At the eastern end is Carnarvon Primary School, built in the late 1960s. The north-western corner of Crow Close has been developed as a children’s playground with minimal disruption to the earthworks and other features. Topographically, the field is a low-lying spur falling away to the north, east and, less markedly, the south. The spur is Triassic Hollygate Sandstone, a geological formation that extends westwards through the centre of Bingham (BGS, 1996). The flat areas to the north and east of the spur are deposits of clay laid down in a post-glacial lake. To the south lies mudstone of the Triassic Edwalton Formation. Most of the features that are possibly indicative of housing are on the area of sandstone. According to Soilscape of England and Wales, (2007) the soils on the lake deposit are of the loamy and clayey floodplain type with naturally high groundwater and moderate natural fertility. Evidence of the high water table is periodic flooding after heavy rain, the most recent being in the summer of 2003 when the school was flooded. The field does not appear to have been ploughed since medieval times. It is currently (2009) owned by the Southwell Diocese and is rented out for grazing cattle.